The fourth technique can also be the first technique since it allows us to tune in to Source Consciousness and move it with the Violet Fire of Transmutation and Ascension. 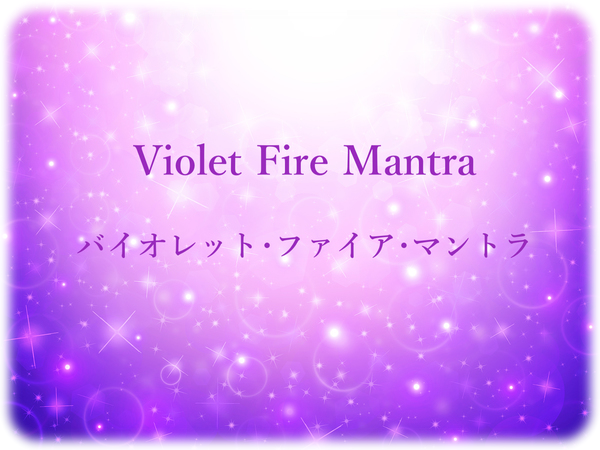 The Violet Fire Mantra transmutes the vibration of old habits and emotions into frequencies of greater Love, Compassion and Understanding for the challenges we face in our life. Violet Fire is the most important tool we can learn to change the momentum of our life into Divine Presence and become the real loving personality that we all strive to live in our daily life. This is not about thinking or controlling our emotions or the way our mind is reacting. It is as natural as lighting a candle in a dark room. When we light a candle, the darkness automatically becomes brighter. There is no struggle with the emotions of darkness that cloud our vision. When we introduce the Presence of the Light of Love, our entire being becomes brighter and more naturally loving. Focusing on our problems only reinforces them. We must introduce a more Loving Presence without thinking about our problems. Experiencing the Violet Fire Mantra naturally shifts our attention into the feeling of more Divine Love while simultaneously transmuting our old habits and old emotional responses into more friendliness, compassion and love. The Violet Fire Mantra is a simple technique that anyone can learn to effectively transform the way we feel and react to the challenges of the world around us.